For an example hookup, see this diagram. Is there a Fritzing component for this board? I have a question and I would like to know your opinion about it. I want to connect my MCU whose pins are only tolerant to 3.3v to an RS-232 device. From what I understand, I could connect my MCU (3.3v logic) to the driver pins, but feed (Vcc) the driver to 5.0v, right? Even if I feed the drive to 5.0v can I connect it to the MCU (3.3v logic)? The datasheet says on page 8: "This series is ideal for + 3.3V-only systems, mixed + 3.3V to + 5.5V systems, or + 5.0V-only systems that require true RS-232 performance. " But I can not understand how the driver can distinguish if the output to the MCU should be 5v or 3.3v. I got a handful of these recently. They appeared to be working correctly. I am using one to boost a ttl signal to rs232 and then another to bring it back to ttl levels. However, when I scoped the rs232 output (T1OUT) The signal is +-5V. Exactly the same as the signal going to the device (T1IN). Shouldn't it be +-13.2v as the datasheet states? What are other people seeing? +/-13.2V is the absolute maximum on the output pins, not the expected output. The expected output is +/-5V, which it sounds like you're getting. See "Driver Outputs" section of the Electrical Characteristics table, near the bottom of page 2. I'm looking to use this in a mostly-permanent application, and would like some sort of screw/bolt holes. Is it safe to drill small holes in the corners, approximately where the open source logo, and where the "M" are? There don't appear to be any traces there, just the ground plane copper. You should be okay to do that; I'd use either nylon screws and standoffs or non-conductive washers (at the very least) because you'll probably expose copper doing that and you don't want to accidentally chassis bond your ground plane. I have a few of these boards to mod an existing circuit, the boards are getting pretty hot to the point of being uncomfortable to touch. Any previous instances of this happening and if so is there a fix? That is extremely unusual. Triple check your connections and make sure that you're not dumping a TX to a TX and causing bus contention, or possibly exceeding your supply voltage rules. If not, contact tech support; maybe a bad batch went out? It's unlikely, but possible. Can this handle 12V RS232 signals? yes; it also handles the signal inversion and level shifting needed for true RS232 signals. 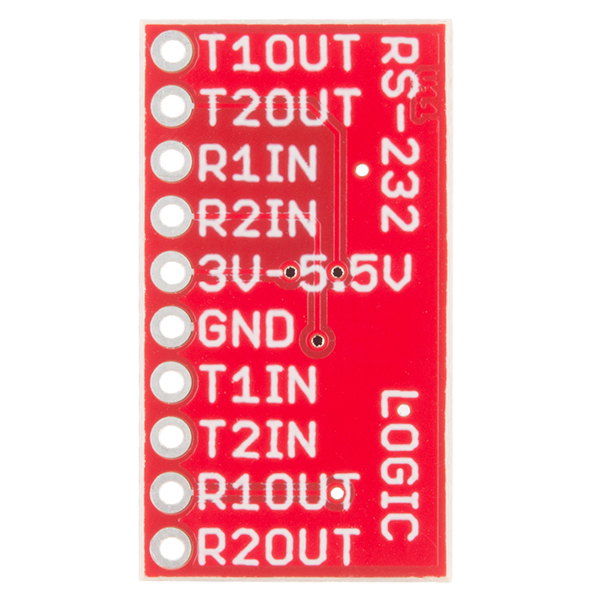 Take this and add an SC16IS740/50/60 (an I2C-based UART), or equivalent, on the back and you got a neat little board to add RS232 to an I2C bus. Any chance we will ever see a board like this with a DB9 and a MAX3232 on board? Just about every time I use RS232 there is a DB9 connector somewhere, either on the PC or a device. Very Cool! Now, if you could put LEDs on it for status, it would be perfect! OMG - what a HUGE PITA the naming convention used on the pins of this board!! It is a real nightmare to try and remember that R1IN is RS232 but T1IN is TTL/5V! I hope you redo this board some day and come up with a more intuitive pin-naming convention. Serial comms is always confusing (who is sending, who is receiving.. ) - Also it would be really super if you brought out the Enable pin as well. You should add more holes for ground connections. If you use this for two RS-232 connections you need to connect 3 wires to one hole. Having 3 holes would make it much easier to wire. Be aware that the datasheet says "The drivers are inverting level transmitters that convert TTL or CMOS logic levels to Â± 5.0V EIA/TIA-232 levels inverted relative to the in- put logic levels.". So, it wont work in serial communication between RS232-ttl (like in beaglebone(3.3V) with arduino(5V) or raspberrypi(3.3v) with arduino). Since it inverts the bits, it will also invert the start and stop bits, messing up with the serial protocol. Most devices do let you play with the start and stop bits if you have the board already. If not you really just need a logic level converter to go from the 5V Arduino to the SBC (the Arduino will read the 3.3V just fine). Is it possible to program the Arduino Pro Mini through this device? My project interfaces with anther device via RS232 so I have the MAX to communicate with the other device. Instead of taking my project apart to reprogram it I would like to simply use the external interface. 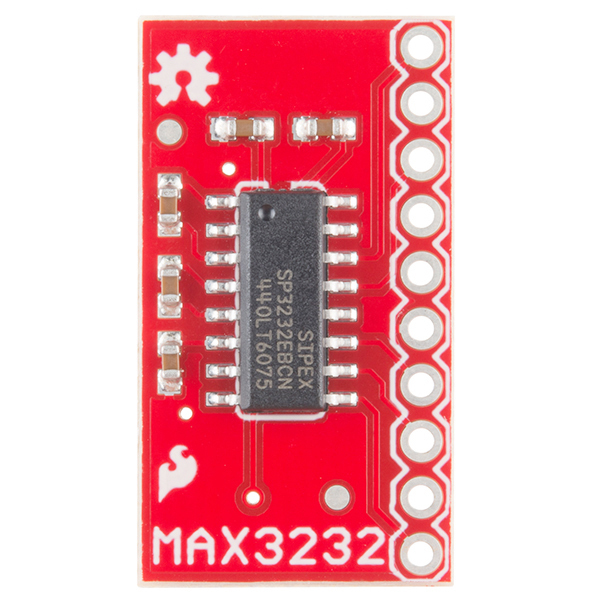 I bought another MAX and hooked an FTDI USB programmer to it. I can see my serial traffic when the project is running but for some reason the Pro Mini doesn't respond to the Arduino IDE. You should be able to program through it, although I've never tried it. Start the upload as normal in the Arduino IDE, then push the reset button on the Pro Mini. When the Pro Mini comes out of reset, it will briefly enter the bootloader, and the upload should proceed as normal. Yes, the voltage range is 3V-5.5V. What is the logic level? is it 3v or 5v? Does it change depending on the supply voltage? Am I reading the schematic correctly? Is this, somehow, dual channel? I'm considering making a 'serial spy' that listens to both the Rx and Tx lines of a cable, and transmits them out another converter to a computer, so you can see how the devices are communicating. Dual channel (being able to have two Rx lines) would be awesome. Yup, it's dual channel, so sniffing RX and TX and dumping that into, say, an FTDI Basic board would be a terrific application for this. During normal operation how much current does this chip draws? I'm I reading correct from the datasheet that it only takes 1 microAmp? That's what I was going to use this board for. I have to run twisted paired signals about 12 feet. Yes. You put Arduino RX to R1IN, Arduino TX to R1OUT, serial devices TX to R1IN, RX to T1OUT. Then add ground and voltage. Hope this helps. This using a Mega 2560, FWIW. Shouldn't serial devices TX not go onto T1IN? This was needed a longgg time ago. Thanks for finally getting around to make it! 3v3 projects will now be able to communicate to the outside world. I needed this because the device I'm attaching to was RS232 format output only, and the Pi /dev/ttyAMA0 only likes TTL, so this did the trick. 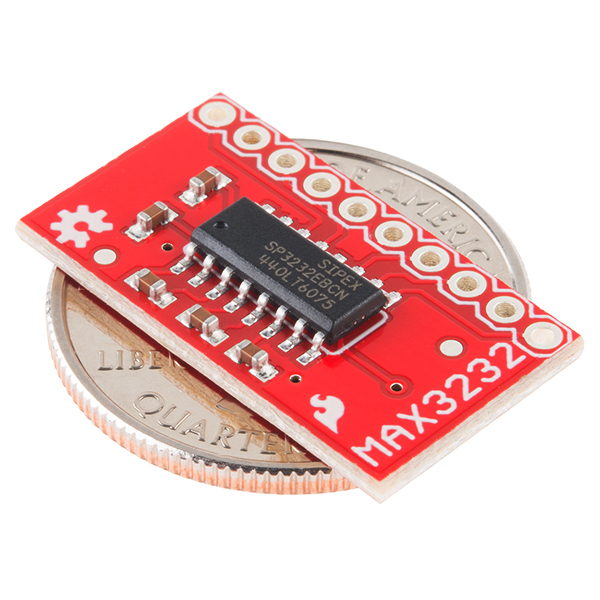 Only thing I had hesitation about was that I had to go to Maxim's documentation to figure out the different pinouts, and I'd have rather that info been readily obvious to me on Sparkfun's website, but I couldn't find it. it works very good, nice design. Works just like it should. I have used 5 of these and no problems. This little board does what I needed and was easy to integrate into my project. The I/O holes all in a line are nice as well as the labels of each hole on the back. I realized I needed to add an RS232 driver to an existing circuit board lacking in board space. This little board allowed me to mount it vertically with all the signals accessible on a .1" spacing. It worked like a charm and converts the signals to the proper levels. I needed a quick, simple, economical way to interface a PC's RS-232 port to a PICAXE micro. Worked perfectly, no problems. Great product! Does the job perfectly in a small package. Just what I needed to add serial port communications to my +5V project. I had an old homebrew max232 circuit that gave up the smoke and didn't feel like making another. 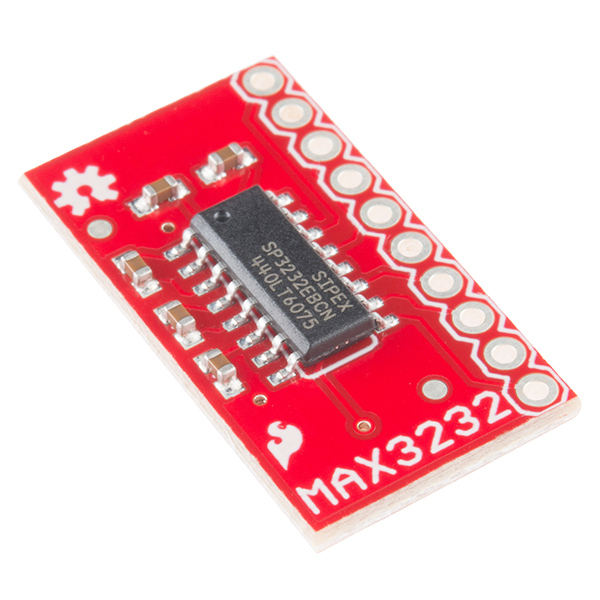 The MAX3232 breakout from Sparkfun worked perfectly as a replacement. I even bought a couple extra for future needs. I use this on one of the boards I designed. Ebay compatible boards are cheaper but this one usually has good quality. Slightly lowering its price will be nice. Only wish the labeling listed RS-232 inputs and outputs as an option. Wiring it up is a bit confusing at first. At the very least, on-line documentation should provide common wiring for the device (e.g., RTS, CTS, TxD, and RxD for DTE and DCE). Having a project which tapped into the RS232 line between my Ham Radio and the computer, I needed something which would listen to the commands being sent down the line. This afforded me the perfect form factor to plug into my circuit board and provide the necessary translation. I had a great deal of trouble understanding which line went to the TX line and which went to the RX (I'm a little slow and easily confused! ), but once I finally figured it out, everything went fine! This board was easy to work with, perfect for my prototype! Does what it is supposed to do and fairly versatile. This breakout board neatly converts either TTL or 3v3 serial outputs to RS232-level signals and vice versa. This is great when you have a serial port which requires these levels - such as a PC with a serial card or a modem. If you need this conversion this is the board for you. Make sure you have a gended-changer if you need one. Enjoy! They are great so far, except they are a bit expensive, but they saved us much effort thanks to the enhanced ESD Protection of the SIPEX SP3232. A bit overkill, though. I'd prefer a one-channel version that doesn't take up as much space. Great tool, but keep in mind that the behavior is different depending on the direction. I have a RS-232 device trying to get it to 3.3 TTL. To pull that off, you have to route the RS-232 device into the RXIN and the uC out of the RXOUT. I initially had it going into the TXIN and uC out of TXOUT, but that kept logic levels higher than my Vin. Hopefully something that might save a poor uController some day. Easy way to get 2 REAL RS232 interfaces on your project. If you want a quick way to get TTL signals to RS-232 levels, this is a quick and easy way to do it without surface mount solder tools. I needed a 3.3v TTL to RS232 converter to talk to my HC-06 Bluetooth modules in order to use the AT commands. Worked great. I need to quickly build a board to translate TTL serial into RS232 signals, this was the perfect solution to use on breadboard. Works great, just like you'd expect a MAX3232 to be. Would have 5 stars if it could plug into the programming headder on the Arduino Pros and have holes for the terminal side DB9 connector along with headders for the RX2 and TX2. But this is good, much handier than stuffing DIP in breadboard along with the caps.